Welcome! To the second part of TV Ate My Wardrobe’s Oscar coverage. This post has a whole lot of sparkle, white frocks, ladysuit tails and more. For Part 1 head here. Wakanda Forever! Lupita Nyong’o wore a lot of armor inspired looks during the Black Panther press tour and this gold sequin Atelier Versace is serving up red carpet warrior to new levels. Danai Gurira wears soft blush Gabriela Hearst with a fierce edge thanks to the silver detail on her shaved head. 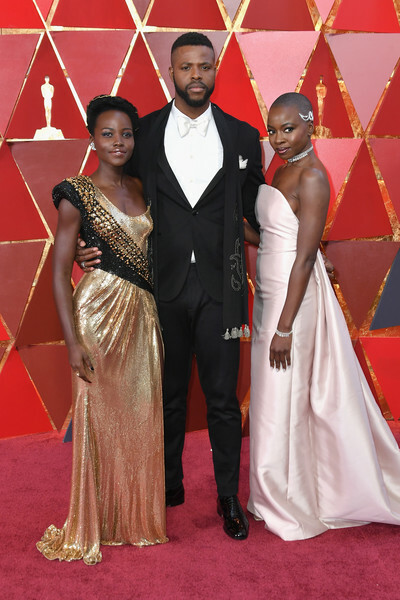 Adding a touch of African heritage with a scarf is Winston Duke, wearing a fabulous Etro ensemble. I really hope Black Panther will get honored at the 91st Academy Awards. A dress that shimmers and shimmies is the dream; Gal Gadot has the perfect Givenchy couture gown. I was thrilled to see Gina Rodriguez presenting and she had the gown to match in Zuhair Murad. 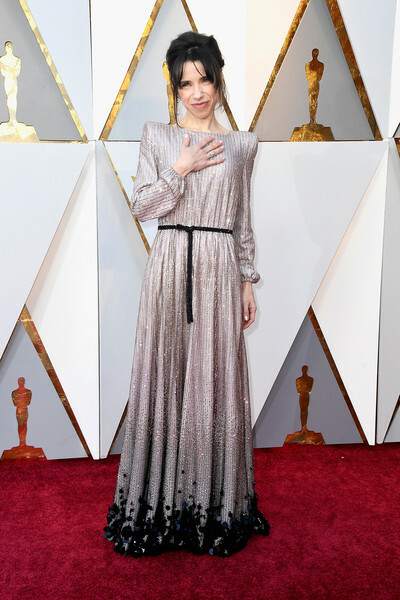 Sally Hawkins does whimsical delight in The Shape ff Water and IRL in a sequin Armani Prive gown. 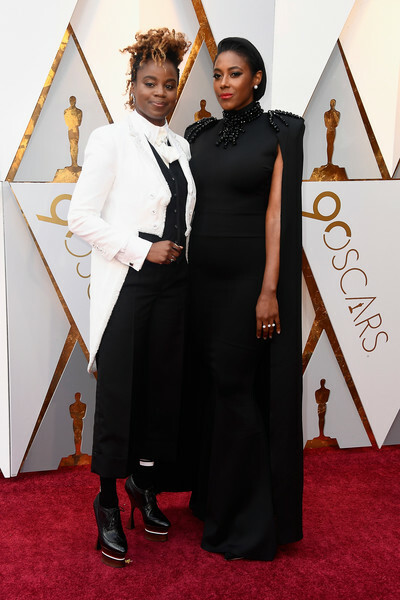 More cape and ladysuit excellence from Sarah Broom and Dee Rees with Rees going all in wearing tales. I am also in awe of her shoes. Keeping it classic in white Calvin Klein by Appointment. Laura Dern now gets the great honor of once again being my lock screen image as I couldn’t not make the Dern/Gerwig pairing anything but that. Now for something completely different with a dash of leather daddy on the red carpet. 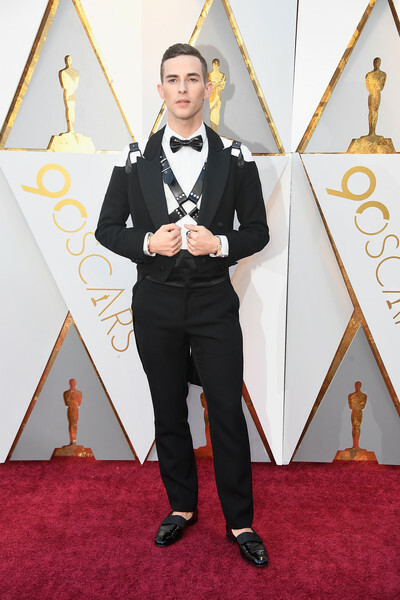 Olympic figure skater Adam Rippon took the cold shoulder trend in an unexpected direction in a cropped Jeremy Scott for Moschino jacket, leather harness and patent leather bow-tie. I saw Lady Bird for a second time yesterday and Beanie Feldstein steals every scene she is in. 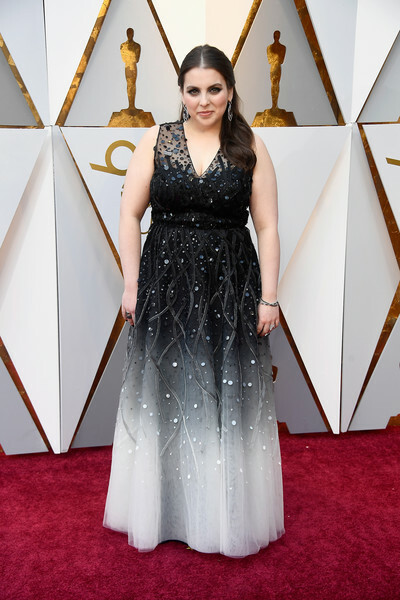 And she looks wonderful in ombré Sachin and Babi. The detail looks like roots from a magical tree. Perfect movie prom frock. There were a number of stand out white frocks yesterday, including Janet Mock in stunning caped Christian Siriano. 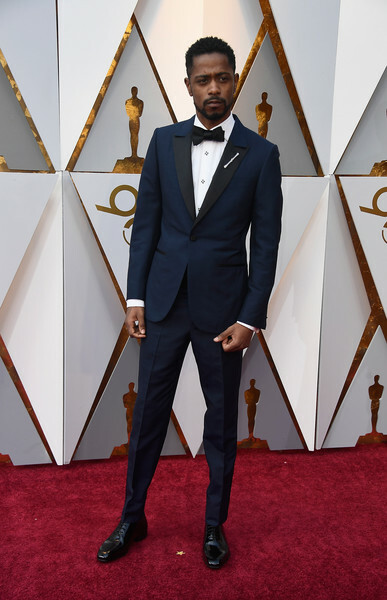 Team Get Out looked pretty damn good and Lakeith Stanfield was my favorite guy in blue wearing Ermenegildo Zegna Couture. Jane Fonda mentioned that the Oscar set was reminiscent of Barbarella, she’s also serving so much sci-fi shoulders in custom Balmain. Oscar Isaac recently discussed the reasons why he decided to marry long-time girlfriend Elvira Lind and the pair look cool af at the Academy Awards. Her dress has a whole Scandinavian vibe and he looks totally fine with his wife being taller than him in heels. 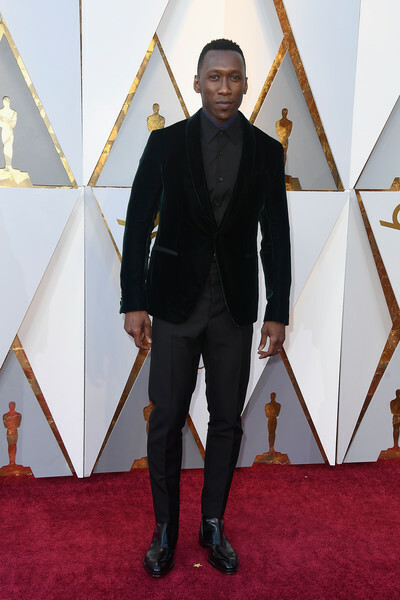 Last year Mahershala Ali was one of the best dressed award season contenders. And he continues this streak. It is like he invented the velvet jacket in Berluti. Couple faves Emily V. Gordon and Kumail Nanjiani go super classic formal; Kumail ditches the pattern for the Bond look in Ermenegildo Zegna and Emily is a tulle queen in J. Mendel. The rest of the party pictures will be up on here later in the week, but I couldn’t not include Emily’s incredible change from sweet to caped snake charmer. It would probably be much easier to go around than climb over the seats, but I’m honestly a bit impressed that Jennifer Lawrence manages this in a fancy Dior gown I actually like AND with a glass of wine in her hand. No falling over this time. And for that she gets the final picture of this post.